Never been a better week to flirt with the avant garde. Tomorrow night's Eurocultured includes Czech band Psi Vojaci which should be interesting. Then Wednesday it's the Other Room's June session - and Thursday a new night in Withington, at Fuel, promoting sound work, Counting Backwards. Holly Pester, who was fantastic at the Other Room earlier in the year is one of the performers. Then again, why not whiz down to London for the weekend and the Openned event on Brick Lane on Saturday, with their "Openned book table." In the mean time, the ever wonderful Ubu.web has put together a brilliantly comprehensive page of John Ashbery recordings. Sprinkle them through your iPod and be constantly surprised. Typically, I'm not able to benefit from most of this because of work commitments, missing Tuesday's Social Media Cafe as well. Craig Finn, of American rock band The Hold Steady, writes a beautiful piece in yesterday's Guardian, about how, when writing a song on his new album, he remembered the obscure indie band Heavenly, their song "Space Manatee" which he had the single of a decade and a half ago, and of the suicide of Heavenly's drummer, Matthew Fletcher, an act which ended the band. I was a great fan of C86 style music, and, to a lesser degree, kept following the obscure bands that followed in its wake on labels such as Sarah Records and Fierce Panda. As Finn articulately states, this was music that was made with care, devotion almost, but without ever expecting fame or fortune. Yet a record recorded in obscurity could surface on a college radio station, and years later find itself the subject of a song by a band who are, in many ways, a world away from Heavenly. It reminds us that public suicides are also private ones. None of us could ever know Matthew Fletcher any more than we knew Kurt Cobain, yet in some ways we pretend to know the latter, and share, somewhat, in an inherited grief. Around that time, the mid nineties, I wrote a song called "Glamour Suicide", partly as a response to a Jesus and Mary Chain song, but also against that whole myth of rock and roll suicide being a glamorous thing. I think it was Kurt Cobain's mother who put it best, referring to "that stupid club" of rock and roll deaths. Finn reminds us that there are many less celebrated figures who have taken their own life, and but for a few pieces of vinyl wouldn't be remembered at all, outside of their grieving family. When I wrote "Glamour Suicide" I hadn't known anyone who had taken their own life, though there was a guy who I had worked with a couple of years before who had made several attempts. Over a decade later, I know of three suicides, one a close friend, (which I touch on obliquely in my recent long poem, "Juxtaposition #4") and the sense that unlike other deaths, suicide is the one that never goes away - the pain that keeps on hurting - is self-evident. That song's rhythm slows down as if on life support - but it's quite a jaunty song, despite the lyrics and the theme. I was 27 when I wrote it. Was I in a lonely place (as the Joy Division song would have it) when I wrote it? I don't think I was - but it was almost like I had a premonition of the suicides that would touch me. Life seems really hard sometimes in your teens and early twenties, but later, you realise that its later that you get the real battle scars - you have seen people close to you die, accidentally, purposely, whatever. What I liked about Finn's piece is that it somehow chimes with why we do art - not to be famous - but because somehow it matters, it can matter, and in ways which we don't always know - so that over a decade after last thinking about this particular song, another artist is reminded of it, and recalls it in song. I remember that great little song "Sweeping the Nation" by Spearmint with it's list of obscure bands, or Allen Ginsberg talking about "the best minds of my generation" in "Howl". There's a brilliant piece in this month's Uncut magazine about the Poetry International in 1965 which brought the counterculture to the UK for the first time. If the beats liked jazz, the hippies liked rock and roll, and it made all the difference somehow. In our creative spaces, it is as important to remember those who tried, as it is to remember those who may have succeeded. I like reading old poetry magazines and anthologies - such as the remarkable Angel Hair anthology which celebrates the late 60s/early 70s poetry magazine of the same name. The lovely Poetry Magazines website is a great place to browse more recent British magazines. It was one of those heavy weekends. Heavy sky, heavy head, heavy feet. Everything ached with the sheer heaviness of it all, and when I finally made it home, I hardly had time to hit the sofa, and pour a hair-of-the-dog beer before my eyes were losing it for me. I woke with the tele on, and it was like watching the inside of my own life. There was something delirious about it - the fat man with the seventies tash, flying in and out of New York on the redeye - making the most of the inflight catering, first class of course, leching at the air hostesses knowing that he'd always be invited back. The colours of the neon New York skyline - and then - as if jolted awake by a loud noise - coming up short in a pub in west London. Could almost smell the cigarette-whiskey seats. What's that? I can hardly hear it. Turn up the sound. A kicking soundtrack. Some Joy Division, some Gang of Four, some faggott disco music. John Self looking at the camera, looking right through the screen at me, as if to say, "I'll have you son." So I experienced it, part one of the BBC's adaption of unfilmable Money, with Nick Frost well-cast as loser John Self. The period detail was just about right, and the colours of the sets and the filming gave the whole thing a bit of a hallucinatory hue. I can hardly remember reading Money, it's been so long ago, but Amis's classic always had that slightly dream-nightmare-like quality to it - as if any scene that went on for too long could be wished away in a hangover. So, halfway through, I watched it in the right frame of mind, half falling asleep like Self himself. I look forward to the concluding part. A sweltering Sunday, and I need to stay indoors a bit just to catch up on various domestic chores, as I'm away a lot in the next month. Had a couple of interesting weeks - almost back to normal activity following the op, and finally off the meds this weekend - though I go back in a month. Guess it makes us lucky. Yet all this frantic activity isn't necessarily that conducive to creative work. I've said it before, that the irony about literary fame and success is that the good work happens in the shadows, in the private time. Whereas sportsman have their greatest moments in front of the cameras, and despite all the hard work that goes into it, actors and musicians require the spotlight; writers only come blinking into the sunlight when the work is all done, when the good things have happened. I've been putting together a short collection of poems, and though it took a week of intense re-reading to choose the line-up and the order, the hard work happened at other times. Pleasingly, there are three recent poems in the selection - and hopefully these are as good as ones I've had a longer time to consider. More of this later. I'm going to be looking at my web presence shortly as well - as turning things on their head a bit - I realise that a writer has to do more than just write new stuff, good as it is. Readers, if there are still such things, want the full experience - a fulfilling finished work, nicely packaged, and with something of a backstory. What would you say when reading a poem out loud for instance? Maybe the whirlpool of activity I get sucked into every spring and autumn will subside a bit under a new government - certainly I've drank my fair share of wine and ate my fair share of canapes and small dishes over the years - all paid for by some project somewhere. I have a horribly sneaking suspicion that the one area of cuts that the government will find it obstinately difficult to cut is the money paid out to consultants, particularly the big boys, who will surely bring in their restructuring expertise to replace their special advice departments. Manchester's great virtues remains its underground, get-up-and-go side. Most of the gems in the year's creative cycle have come from individuals and groups of people getting together and just doing something. It may, in fact, turn out to be easier to do this in a harsher economic climate, though anyone who has ever run a volunteer programme knows that a little bit of funding goes further here than almost anywhere else. Lots to do, lots to think about. Football season is over, but the World Cup will inevitably take over for a month or so. At Futureeverything this year one of the themes was serendipity city - and as a phrase to describe Manchester its ideal. Forgot to mention that the BBC's adaption of "Money" is on tonight. I've often wondered why the BBC doesn't adapt more contemporary novels - though this is quarter of a century old now, so doesn't even count as that. Amis's novel has been referred to as unfilmable, which always seemed a little ridiculous, given its settings. I've some apprehension, given the way the BBC usually films the 80s (e.g. as costume drama) but was given hope by both the way they've done last week's Boy George drama "Worried about the Boy" (though that was Manchester's excellent Red Productions - home of Queer as Folk - who clearly know what they're doing with pop culture) and by the presence of Nick Frost, who seems big and loud enough to play John Self. There's an interview with Martin Amis afterwards on BBC4 as well. Take advantage of the sunshine - a month till the longest day - and the weather finally improving after a wet, cold, dark spring has made all the difference. Not the time to be staying in writing of course - and having gone back to work, and it being quite full on, I'd hardly wrote a thing until Tuesday, when I sat outside of the Red Lion in Withington, with the sound of the sprinkler hose on the bowling green a murmur below the pub chatter, and wrote two new poems. You need to find a space to write, it's true, but sometimes that space can be carved out of the busy times and places. It's Chorlton Arts Festival starting this weekend, and there's a wide range of local activities - including a few writing events. Most things are free or low cost, and though I'm too busy to go to much I hope to get to a couple of things. There's a handy programme available from all the usual places. I picked up mine yesterday from the Portico Library in town, where I'd amazingly never been before. An astonishing gem of Manchester's Victorian architecture - a private lending library that remains a private club. There's a sign on the stairway saying "have you paid for your lunch?" and you can well imagine the languid atmosphere taking all such wordly decisions away from you. In the back room there was a copy of "Ulysses" (I'm guessing the first American edition, but might be wrong - I couldn't see "Shakespeare & Company" on the spine); the central dome fills the room with light on a summery evening like yesterday - and one couldn't help but be amused by the wooden bookshelves with their inscribed titles - on two sides of the room, the Victorian book lender was able to borrow "Polite Literature". I really, really want to write something polite, now....Last night was for the new website for "Visit Manchester" which is Manchester's visitor website - but since we all visit Manchester, even those of us who live here, it's going to be a real asset for the city. There's always so much going on in Manchester that it's so easy to miss things. This week alone I forgot all about Don Paterson reading at the Dancehouse on Monday, and "Control" being shown outdoors at Spinningfields last night. Following on from last week's launch of "Extracts from Levona" I need to get back to some other projects over the next few weeks. I've plenty of things at different stages. 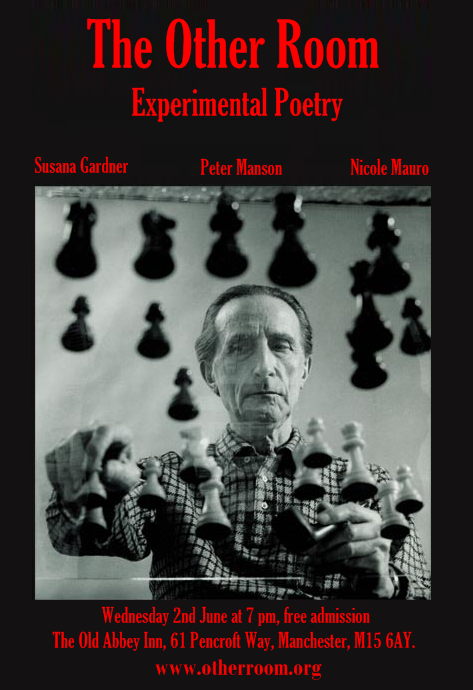 For instance on Monday I spoke about the OuLiPo and realised it would be useful to write a little introduction to experimental literature - as it's an area that most people aren't aware of, but find fascinating when they discover it. I think in a world of so many distractions - the idea that literature can be not only engaging, but innovative, experimental, playful, original can often come as a surprise to people who only see the high street bookshelves. Lie trembling in the dirt. But made to be set fast. How few of us will last? I ran a game of Exquisite Corpse at the Contact Theatre yesterday as part of the Playeverything unconference. Named for a line that came from the first time it was played, by its creators, the Surrealists, "the exquisite corpse will drink the new wine", it's a version of the game you may have played as a kid, "consequences", where you write something down then pass it on, so that people can't see what you've written. Exquisite Corpse is a way to generate unexpected poetry. Although there were only three of us, we produced eight six line poems which were surprising, funny, and poignant. It was part of a session I was giving about experimental poetry, and so we did a version of the game where we took found lines from different pages of the same publication - but it can just as easily be created from scratch. On Monday, I'll be speaking at Madlab at Interesting Monday, about the OuLiPo, and I think rather than just listen to me droning on, we'll play a game or two. All are welcome. Attending Playeverything unconference at Contact later today. Need to cohere thoughts. Perhaps some McLuhan-ish CounterBlasts. Need to think again where I am in the creative spectrum: am I primary producer (poet) secondary producer (editor) or tertiary producer (critic) and are these even distinctions in my work. Collaboration: is it the same as participation? Are games collaborative - or does there have to be a creative outcome as well as a "rewards" outcome. (Lego=Building Creativity. Foursquare=Collecting Rewards.) Didn't I grow out of wanting House Points when I was about 14? Opensource models / D.I.Y. production / curated-collated participatory projects. As an artist/writer/musician do I want to "let" community produce work or do I want to produce work in/for a community. Consumption as well as production. 2 days of conference where I was essentially looking at Powerpoints. Old style audience-role, rather than new-style "art of with". Contextualisation and dissemination: I think its important to have a cultural breadth of knowledge. Ideas are serendipitous as well as people. Play is serious. Or rather... if you are building a D.I.Y. instrument shouldn't it be more about then creating some serious "outputs" rather than a (say) iPad orchestra playing chopsticks again. My old question: are writers "cultural middlemen" - repurposing stories that are then repurposed e.g. for games. Most experts/academics/creatives are niche - even when (especially when?) they're proclaiming multi-disciplinary work. Other people can fill in the very large gaps I have in my skillbase. As always, this year's FutureEverything festival (previously Futuresonic) has been a cornucopia of delights - and has taken up the best part of my week. They used to call it the "urban Glastonbury" and like that festival it's impossible to go to everything, and you either have a choice: pick out the highlights or go with the flow. Given that one of the themes this year was called "Serendipity City" I've mostly done the second. With art, music, debate and more it's good to sample different aspects of the week. The main art exhibition, "Serendipity City" took place at the new Hive building in the Northern Quarter and hosted Wednesday's launch. The work there was an interdisciplinary pleasure, and one of the few exhibitions I've been to which really addresses urbanism in a genuinely challenging way. With the city's decision to close Urbis and turn it into the National Football Museum, this international exhibition was a reminder of the contradiction's in the city's policy and vision. Football, boringly everpresent everywhere else in the city, was not in the building. Along with the "Contents May Vary" group show in the basement bar of the Palace Hotel, the art strand this year has been a real highlight - I'm only sorry I won't have time to go to the artists/curators talks this afternoon at Castlefield gallery. Contemporary art remains a real strength of the North West, and these temporary shows and venues are, in the absence of more permanent gallery spaces, vital. The various conference strands - settled on the Contact Theatre - have been challenging, both on a technical level (Glonet's conference strand had performers and speakers from different parts of the world beaming in via the internet) and an intellectual one. The festival has grown to such a result that the conference lacked a single centre - a keynote - but instead had several parallel tracks: opendata, imagination, next generation broadband connectivity - that probably added to the festival's reach, but may have diluted the sense of community. For once, I found myself wandering from session to session a little randomly. That said the panel discussions in particular were very strong - with the exception of a poorly focussed Future of Music session on Thursday afternoon - looking at new creativity, and models for opensource participation. Yesterday afternoon also had a collaboration with Transmediale in Berlin, with the opening McLuhan in Europe lecture.Darren Wersher made explicit the links between Marshall Mcluhan's thinking and the 20th century avant garde, particularly Ezra Pound and Wyndham Lewis. Mcluhan's thinking around media and communication - particularly his provocative "probes" (like "The medium is the message") were referred to by Wersher as "weapons-grade aphorisms" - owe much to the avant garde literature that inspired him as an English literature professor. Wersher's premise was that with a poets being consigned to contemporary irrelevance, this ignorance of Mcluhan's sources in much of the new media veneration of him, leaves a large gap. He talked of the OuLiPo inspired Canadian avant gardeist Christian Bok whose book Eunoia is now being followed by a desire to embed poetry within the DNA of an organism. It was a somewhat thin audience at the end of a busy two days for what was probably the strongest talk of the conference. As possibly the only poet in the audience, I found it a fascinating discussion that took in scientific developments, the 20th century avant garde, and deep, profound questions about language and art. Coincidentally it will feed into a small talk I'm giving on Monday at Madlab about the OuLiPo as part of "interesting Monday." Wersher's lecture topped off a great day of mental overstimulation. Futureeverything continues this weekend, with more playful elements such as today's free unconference and workshops, Playeverything - whilst the music and art program are both carrying on. Conceived in the weeks recuperating after my eye op, and - coincidentally - a couple of days after the General Election, A.Happening at Madlab yesterday was partly a chance to launch my chapbook "Extracts from Levona" from Knives, Forks and Spoons Press, but also an opportunity to put together a more esoteric artistic afternoon. Although everyone who attended had some connection with the performers, there was a good sized crowd, with toddlers and teenagers alongside the adults. I'm not sure we'd qualify as "family friendly", but it made the event far less solemn than these things can sometimes be. I was really grateful to the other performers, Matt and Chi-chi for topping and tailing my reading respectively, and though our planned showing of some short films hit some technical glitches, Karen, my compere kept the show on the road admirably. I read the 3rd of the 4 poems in "Extracts from Levona", partly because its the most political of the four; though I realise with these long stream-of-consciousness pieces, that the reading of them is now as vital as the writing of them. I like work that can't be paraphrased, has to be experienced, and I realise that my jokey subtitle for the collection "work in progress" refers to the individual pieces as well. It seems only appropriate that in a week of politicial uncertainty, that I should be performing work of a somewhat provisional nature. We did film the event, but I'll have to see how that came out before deciding whether to put it online. In the mean time, you can see my reading the 4th piece from the book here. Yesterday was a lovely way to spend a Saturday afternoon, and I realise, probably the first artistic event I've put on for over a decade - so thanks to all those who helped, performed, and most of all, attended. Once the dust settles, I might see about putting on another one. With virtually all the General Election results in, the result is the one I've expected for more than a month - a Conservative lead, but with no overall majority. That they have topped the 300 seat mark because the Lib Dem surge never happened, and, almost certainly has been helped by the money that Lord Ashcroft has poured into marginals. Still unable to win in the Northern cities or Scotland, it is in the English towns and their surroundings that they have made inroads. "Motorway man" turns out to be a shade of blue; though the economic crisis will have a lot to do with it as well. For me - and for the country - the worse thing would have been a Labour meltdown. There's no use in saying that a Labour party that gets less than 30% of the vote - particularly given its strength in Scotland (where it increased its share of the vote) and the North - is a success, but it could have been much, much worse. New Labour, like Thatcherism before it, turned electoral success into electoral poison in just over a decade. That Labour did as well as it did yesterday is surely because they returned to a "core vote" strategy. The "game changer" of the election debates turned out to be a media invention, even if it did a lot to bring out the vote. That a discredited MP like Hazel Blears could hold on in Salford, shows how fury at the expenses scandal had nowhere particular to go. So I woke up this morning with no Conservative government, but a strong likelihood of their being one. Cameron's pitch to the Lib Dems makes a lot of sense for him, both in terms of the electoral math, and in forming some kind of "progressive" alliance. At this you have to take Cameron at his word, and not look too deep. The Lib Dems are not only strong amongst the middle class, but they have a sizeable cohort of MPs in Scotland where the Conservatives hardly exist. Any agreement between them would give some legitimacy North of the border. That's assuming, of course, that both Cameron and Clegg can bring their respective parties with them. There is no doubt that Clegg is weaker now than any time in the last month - and the independent minded Lib Dems are unlikely to give up the luxury of their principals for some kind of phantom power. But Cameron as well has failed to make the case. His own right wing will be more convinced than ever that the Cameroons ran a poor campaign - not giving them the carte blanche that is a Tory's (imagined) "right." Besides, one of the problems with our unequal system, is that there are few ways of making things work in reality. A select committee here, a policy bone there, it's difficult to cement the common ground that surely does exist between the two parties. Besides, it is not a time of feast, but of famine; and so there's thin gruel to be had propping up a party running unpopular policies. Another ten or fifteen Lib Dem seats and there'd have been a different game, but that's not to be. However, it's certainly canny of Cameron to realise straight off that as a new broom he would be far better giving some concessions to the Lib Dems at the expense of his own right wing, rather than be at the behest of a ragbag of nationalists and unionists. For Clegg to bring his party with him, he'd need more, I think, than a few vague promises. Like the unwilling frog who gives the scorpion a lift across the river only to be stung halfway across, killing them both, Clegg risks similarly being stung. And why? "Because its in the (scorpion/Conservatives) nature." Yet Cameron knows he can't govern without some deals - and has certainly not got the seats to go it alone. He could play dare with the other parties, knowing that the electorate may not take kindly to another election later this year, without hardly a ball being kicked in anger. Cameron has probably done enough to be allowed to govern, even if that's also allowing him to fail. He'll be well aware that the Labour vote stayed stronger (and without electoral reform will continue to deliver urban seats) than they'd hoped: and that six months or a year from now a Labour party under a new leader campaigning against massive public sector job cuts, won't be so easily swept aside. For Clegg there's a bigger issue about getting into bed with the Tories. What is the endgame? They'll draw a line before agreeing to PR, closer integration with Europe, or abandoning Trident - therefore the Lib Dems need to identify some less global gains. Faced with some kind of shared power, a more pragmatic wishlist will be needed. Here's where the slightly odd nature of the party will find it difficult. Whilst a nationalist party might easily be bought with a few hundred million, the Lib Dem desires are more idealistic. After 13 years with Labour not making any case for a social-democratic alliance with the 3rd party, maybe Clegg has a different vision, of some kind of "progressive" alliance with these "modern" Conservatives which would look to leaving Labour as a niche party of the poor and the North. That would require both an electoral deal with the Tories and a willingness for Cameron to face down his antediluvian wing; neither are that likely. I'm thinking we'll have a Tory administration then; with some kind of arms-length support from the Lib Dems that will be conditional - for the length of a parliamentary session or two, rather than a full term of government. The Lib Dems as some kind of outboard steer on the Tory luxury yacht, stopping it from the worst excesses those Bullington boys would get up to unchecked. Given the electoral math it would be the least bad option - however, I'm not sure our system has the mechanisms in place that could make this work, or whether Cameron's undoubted progressive credentials will soon disappear under the exilir of power. For the Labour Party, assuming that this above scenario fails to materialise, there's only one thing: a marriage of short-term convenience with the Lib Dems to act out their PR fantasies for real. I'm not sure, given the small change in the Lib Dem vote, whether the country has really given its OK to such an idea. Indulging it now, at a time of an economic maelstrom, and when Labour has clearly lost it's mandate, could be an absolute disaster for both parties. Rather, in some ways, a re-grouped Labour party, challenging on every level in six or eighteen months, after a short Conservative term where their worst excesses aren't able to be indulged because of the electoral arithmetic stacked up against them. This is not a call for weak government, but perhaps a more measured period of time, where bad ideas from all parties (e.g. ID cards) are quickly dumped in favour of more valuable ideas (e.g. a fast rail link) where there is a consensus. For their part, and against their baser instincts, the Conservatives will accept all those things that happened under Labour to make life better, which they ostensibly hated, from civil partnerships to the minimum wage. Given the uncertainties probable in this election from day one of the campaign, the collapse in support for marginal parties such as the BNP and UKIP can only be a good thing. With an increased electorate, and increased engagement from that electorate, 2010 looks less like a sea change than was predicted. It could have been better, it could have been much worse. The next few days and weeks will be critical. I must be some kind of inverted Zelig or Forrest Gump character, there in the photograph at inauspicous moments in history. After meeting John Smith in a St. Helen's Labour Club a few months before he died, and seeing Tony Blair arrive at the Royal Festival Hall in 1997, last night found myself shaking hands with Gordon Brown and letting Peter Mandelson into the Green Room at Granada. Anyway, read my full account on local news website Inside the M60 here. Politics both requires and denies the creative response. It requires it, obviously, because art reflects - art enhances - art uncovers; but it also denies it: for "a week is a long time in politics" - and the language of politics can often seem so debased; even as we talk glowingly of "political theatre." There's an invisibility of politics in our everyday life; and yet everything has a political dimension. The more statist a government is, the more this becomes apparent - so a trip to the shop queueing for bread in Soviet Russia; a conversation with neighbours in the old East Germany; a kiss in public in contemporary Dubai - these simple acts are defined and determined by politics. Capitalism, by outsourcing so much to the "capital markets", (it outsources everything except ultimate responsibility), tries to deny politics. Finance is more important. The free market is more important. The bail out of a bank is outsourced to the public; yet the bail out of a country - like Greece - is to fend off the market. Either way the people pay. In "ancient times", politics was something to which we might be indifferent. The body politic related to the city-state, rather than the rural poor. The vote moved from property to person (and then in only a limited way) as recently as 1832. Read "Middlemarch" for a primer in local politics in the first half of the 19th century. Perhaps, in a mature social-democracy, we hoped to have gone back to a previous time, where the cut and thrust of politics didn't bother us - we are governed; not ruled. In return for not considering revolution, we accept a state that governs by consensus. It is no surprise that when that consensus breaks down, as it did most recently during the Thatcher years, that politics becomes raw and we, the consensual abstainers, become, against our will, politicised. It goes without comment that whenever there is any discussion of Scotland or the North that the eighties/Thatcher are referred to in a highly negative way. Yet politicians from Blair to Clegg (never mind Cameron), will express their "admiration" for Thatcher. Language is used to provide us with two parallel worlds; a bit like this week's Dr. Who episode, where "a crack in time" sees people and events literally "running out of time", so that they do not exist; are erased. Of course, you can no more erase the physical effects of Thatcher than you can the grimmer concrete buildings of East Germany. But you can erase the media perceptions. That is why the incident in Rochdale between Gordon Brown and the redoubtable Mrs. Duffy resonated so much. The south of the country in particular had forgotten entirely that such northern towns existed. We all know that Coronation Street or Albert Square are mythical places now; so it's a shock to find anything of them remaining. Memory is false of course, and becomes determined by narrative. Always nostalgic, Andrew O'Hagan, writing in this week's Guardian, speaks of the pet dogs of his youth. They are random curs brought back from the pub by his father. Yet the animals in books he mentions are sentimentalised ones. There is no "Kes"; he doesn't dwell on the rabbits of "Watership Down" and he certainly never mentions the demon rats of James Herbert or Stephen King's Cujo. The 70s we remember through signifiers. Mention of the new Robin Hood film takes me back to the Disney version and the cut out characters that were free within every cereal box. I don't remember the 70s as grim in any way: I was a child then, and parents, as not all parents did, protected us. More than that, the re-writing of the narrative of "hung parliaments" that David Cameron (my age, but not my memories, I'm sure) gives us seems a wrong one. For many of us, growing up in the seventies wasn't a picnic, but it was also a happy time, a simpler time, a fairer time. And in the dog days of the campaign, where, save for the debate-initiated bump for the Lib-Dems, the polling figures are today what they were a month ago; the language has to change again. There is no room for any more of Gordon Brown's tonguetwisters on the economic changes; no room for David Cameron's weekly brand-management (a new message every day, from Big Society to contract with the people); no room either for the Lib-dems mix of brilliant clarity ("scrap Trident") and muddled hobbyism ("regional quotas for immigration will....blah, blah, blah). The Labour leaflet coming through my door today is explicit on what the LibDems will do ("They will scrap child trust funds") and vague on what a vote for Labour will mean (broad statements on the financial recovery, for instance) whilst reverting to the race memory: "a vote for the Lib Dems will be a vote for Cameron." Yet Cameron is not Thatcher; we hardly know whether to believe the images, after all this political class has so discredited itself in the yet to be forgotten expenses scandal. Language was used to cover up what in any other walk of life would have been called "fiddling expenses" or "defrauding the company." In the public sector, you have to walk a language tightrope every day of course. Many council workers have been sacked for far less than the idiot at the Foreign office who though it would be funny to suggest that the Pope open an abortion centre or whatever. The tsunami that will engulf public sector spending, whoever gets in power will be calibrated in a way that talks of efficiency savings, preserving the frontline, restructuring etc. etc. The Arts Council, British Council, and many Universities have already been down this route - worryingly so, given that they are clearly bodies involved in the "knowledge economy" - as their funding allocations have been quietly whittled down. Having an election on a bank holiday week - in Britain! What can they be thinking of? The schools will be closed again on Thursday then - and maybe many parents faced with 2-days of childcare might decide to have the rest off. The postal votes will already be winging their way in, even as the postal workers have quietly agreed a pay settlement which will be beyond what the rest of the public sector will get. Perhaps its the large dose of the West Wing that I've seen in the last few years, but I'm more trusting of the polls than I used to be. We are, it seems, a predictable bunch, at least en masse. There will be local whirlwinds more than national hurricanes perhaps; and it will be all about how the numbers stack up. There are differences between the parties, of course there are; but both Labour and Tories will be hoping it's still a swingometer, left and right, rather than some kind of 3-D model that accounts for a 3rd party and the Celtic fringes. If these are, indeed, the last days of Gordon Brown and the New Labour in power then perhaps its no surprise how hard it is to fashion a narrative. We no longer have a protagonist for our story; our new actors are more brat-pack stars than leading men; there are so few black, asian, female, disabled, or even working class characters in the story that its like a remake of some earlier show; rather than an exciting new format. All of the parties could launch their final push with a hyperbolic "You've 72 hours to save Britain" and that even I would think that they're all partially right, but at the same time, that it's clearly hyperbole, says to me that politics in this country is only just beginning; and that, in terms of the creative writer or other artist, means that we will have to hold back our response. "The 21st century is when it all changes", says Captain Jack in Torchwood. The 21st century may be finally about to begin. A.Happening, Saturday 8th May @ Madlab. I've never won a competition in my life. I was even second in the egg and spoon, whilst my mum in a never repeated triumph, romped home in the mum's race. Though it's dad who has the competitive edge, with a shelf full of bowls and golf prizes, that have accumulated faster as he's got older as he keeps his own amongst the "seniors". I probably should have been suspicious of writing competitions when I entered a poem into one organised by the English department at Lancaster University. Weeks past and I heard nothing so went and tapped on the academic's door who'd organised it. "There was no winner," he said, grandly, "none of the entrants were good enough." How to deflate the fledgling poet? Mind you, it was called the Wordsworth Prize or something similar, and my poem was about tower blocks, so I've only myself to blame. Yet, despite never having won one in my life, I'm not adverse to competitions. 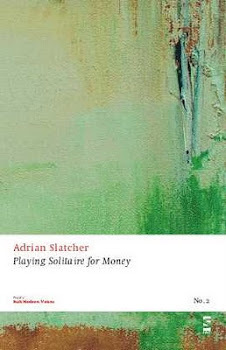 My shortlisting for the Lichfield Prize in 1990s was the first time that my writing had been read by strangers, and even the existence of a prize for an unpublished novel gave it validity. Even today, that openness seems important. I'm not valid for prizes for BME, women, Scottish, Welsh or North Eastern writers; for poets under 35 or novelists under 40. A prize gives focus - and even if/when you don't win get shortlisted, it's almost a guarantee that winning poem or story will be so terrible (i.e. not to your own taste) that you'll be inspired rather than depressed. I do wish prizes would be kinder in terms of short and long lists - to hear their are a thousand entrants and they've shortlisted five is particularly galling. Did I come 6th? Did I come 1000th? So, it's with the usual health warnings I mention 3 recently announced Manchester based prizes that I might just get round to entering. Refreshingly simple is the new Oxfam Short Story Prize - you even have to hand in your entry to one of two shops in the city! The closing date is the end of May and so you've got exactly a month. Now in its third year, the Manchester Prize is on poetry following last year's fiction. Run by MMU and with a good judging panel of Armitage, Greenlaw, and Nagra, It remains quite a lottery, given the size of its prize (£10,000) and the likely number of entries (in the thousands); then there's the high entry fee (£15) and I still find the rules a little restrictive (3-5 poems, up to 120 lines maximum)...but if you're a poet who likes the odd flutter on the Grand National, don't let me stop you. Third and finally, there's Commonword's Dragons Den Style competition for first chapters, which will take place during the literature festival. "This competition provides a rare break for fledgling writers," they say, though whether a public "pitch" will appeal to more sensitive hearts I'm not sure. 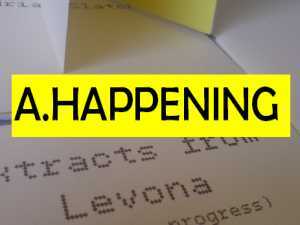 Finally, my own arts event, A Happening, will still take place next Saturday 8th May 3pm onwards at Madlab. More details here, and the full programme will be up there in next couple of days. I'll be reading from Extracts from Levona and you'll be able to buy a copy there - or online in advance here.